Immediately, my mind went to my efforts over this school year with Safe Routes to School. One of the very first things we learned is that a successful SRTS program requires comprehensive efforts from all of the 6 E’s: Engineering, Enforcement, Encouragement, Education, Evaluation, & Equity. When school leaders are frustrated that parents are disregarding their Safe Routes programs or policies, it’s likely the answer lies not in “entitlement” or “laziness,” but in a need for further support & guidance. The National Partnership for Safe Routes to School has provided an excellent online guide that shares strategies and case studies for each of the 6 E’s. If you have any connection to Safe Routes at your school, I highly recommend digging in! Back to the classroom. As Amy Fast described in the tweet above, we need a mix of strategies in order to affect human behavior. Here are my connections for each of the SRTS strategies to the classroom. Especially as some students struggle with the adjustment in coming back from Spring Break, I hope this is a timely post for anyone looking for ways to bolster their classroom culture! Engineering: In Safe Routes, this is design. It might be crosswalks, bulb-outs, flashing lights. In our classrooms, it is how we construct that “third teacher” for learning & appropriate behavior. Does the design of your classroom favor student ownership & agency over teacher control? Do the posters & work on the walls pull their “third teacher” weight? Enforcement: In Safe Routes, this is police or safety patrol monitoring. In our classrooms, this comes back to our classroom expectations. Do you hold regular class meetings to help reinforce expectations? Key here is regular; if they only happen to lecture students for poor behavior, they will not be as effective as meetings that students know they can always depend on for housekeeping outlets & community-building. Do you emphasize and purposefully work on developing self-regulation skills? Encouragement: In Safe Routes, this is fun, excitement, & interest. In our classrooms, this is the way we celebrate together & make our classrooms places to look forward to being in. Do you make time for students to share their high/lows, or to otherwise discuss the exciting or difficult things going on in their lives? Do you have class celebrations that are not tied to behavior rewards? Just to genuinely celebrate all the learning that is happening (such as publishing parties)? Do you take play seriously? Education: In Safe Routes, this is providing safety training & spreading awareness of SRTS goals. In our classrooms, this is ongoing efforts to work toward the why & how of learning & behavior (and not just the what). Have you tried sharing home communication with students so they can take ownership over the why & how of school? Do you give students opportunities to plan their own learning time? Evaluation: In Safe Routes, this is assessing our effectiveness & program course-correction. In our classrooms, this is assessments for our content, yes, but it’s also assessing the culture in our classroom. Do students feel empowered to take ownership over assessments, rubrics, & success criteria? When students seem burnt-out or uninterested, are there strategies that try to bring more trust to the table (rather than clamping down with less trust)? Equity: In Safe Routes, this is accessibility, normalization, & stakeholder voices. In our classrooms, it’s the same thing! Is student voice genuinely honored through devices such as suggestions boxes and/or class meetings, or even back channelling? Do we normalize struggle & try to sit on the same side of the table with our students when they are struggling with behavior (rather than sitting across from them)? This is not intended as a comprehensive or a condemnatory list. Just as a Safe Routes program is always tinkering and working toward stronger strategies, so, too, will we tinker & experiment with our teaching and learning. What are other strategies you would bring to the table? Olwen recently posed one of her fabulous thought-provoking questions. I was going to write a quick, agency-related reply, but then I got thinking some more and decided a blog post was in order. #1: I believe in helping students take the wheel for their own lives. I see myself as a guide, ready to help students make necessary adjustments and to help them discover possibilities they had not yet considered. I recognize that this requires sharing ownership over the learning space, honoring student voice & choice, and letting go of my need to feel “in control” in favor of messy-but-essential student-led planning. #2: I want learning to be as authentic as possible. Studying mentor texts to learn their craft and technique rather than having drills about those techniques. Exploring landforms using Google Earth or by going outside rather than having a powerpoint presentation about them. Using real-world math problems rather than sticking with endless practice sheets. Making connections by using provocations and focusing on big concepts rather than learning every skill and subject in isolation. #3: I try to practice what I preach. If I tell my students to be risk-takers, I want them to know how I’m working on it, too. If I expect them to write poetry, I will work to truly engage in the process right alongside them. If I want them to take action in their community, I will do the same. I never want to be that coach sitting on the ATV riding alongside runners! #4: I love being a teacher, but I have a lot of other interests, too. My family is the most important part of my life, and I have a lot of other passions that help me to feel happy and fulfilled, from biking to carpentry to urban planning. I want them to know this not only because it helps them understand who I am as a human being, but so that they also understand that I truly do love to keep learning new things. #5: My foundation for “classroom management” is a blend of self-regulation, relationships, and humanity. I am terribly imperfect at this, but it is something I strive for. I would rather put my energy in teaching students the tools to regulate their own feelings and impulses than to try and regulate them myself. I would rather sit on the same side of the table to have conversations with individual students rather than place all the blame on the student. I would rather work on finding a solution together rather than keeping them in from recess. I hadn’t realized how important it is for students to really understand all these things about me as their teacher until I wrote them down, so thank you so much, Olwen, for the reflection opportunity! …we considered why we feel the need to drop a fuzzy into a jar to manage behavior (or to remove a previously-rewarded fuzzy), & then work from there? …we held class meetings to discuss what our classroom needs to run smoothly and have follow-up conversations with individual students on how they might help? …we enlisted student assistance in caring for the classroom environment with student jobs such as “wiggle monitor” (helps us know when the class needs time to get up and stretch) or “Calm monitor” (helps initiate a Calm.com session, which are free for schools)? …we work to move away from collective punishments altogether, which can discourage individual students from doing their best (see Life After Clip Charts series)? …we held an occasional class party just to celebrate all our hard work together (no strings; just positive, genuine celebrations of all the good that has happened)? I used to think…students could control a lot more I do now. Now I know…there is a whole lot more out of their control than I realized. I used to think…part of my job as a teacher was to hold them accountable so they could learn responsibility. Now I know…holding a child accountable for that which they have only partial or zero control is fundamentally unjust. I used to think…self-control was all about helping them take care of themselves. Now I know…sometimes our emphasis on control is less about their needs and more about our agenda. how might the way certain values are (or are NOT) emphasized and valued at home impact the way a student views them, such as education and hard work? how might the stability (or lack thereof) of a students’ upbringing impact his/her ability to trust people enough to ask for help, try again, or respond to challenges in responsible ways? to what degree should hold students accountable for values we have always been taught to cherish when they may have been taught that other values matter more (taking care of family over studying for a test, for example)? how might chronic or toxic stress impact a student’s capacity for self-control? I suspect the list of questions could go on for some time. 1) we can’t ignore the reality of compassion fatigue and why self care should be a massive emphasis for teachers everywhere. It’s incredibly draining for teachers who choose to seek understanding and responsiveness amid a myriad of difficult circumstances. 2) it’s worth considering why self-regulation > self-control. How can assuming more ownership over this issue of control with a stance of curiosity impact the students in your classroom? What makes the above statement from George Couros true? What makes the quality of relationships within a school so defining? 1. Content is available everywhere: Khan Academy, Google, tutoring software. Our secret weapon as teachers is our rapport and responsiveness to students’ needs. As such, we should challenge anything that seeks to twist our role from responsive guides to automated deliverers (we must remain agents that purposely wield the textbooks, tech, etc. to meet students needs — and not become pawns being acted upon by such resources). 2. “Kids don’t learn from people they don’t like.” If you have somehow missed the phenomenally inspiring video from Rita Pierson, you’ve got to check it out. Our students will remember the way they were treated in our classrooms for far longer than any clever science lesson or math worksheet. While 180 days may seem long, if you do the math of an average class of 25-30 students, that only gives us 6-7 days per student to prove to them that they matter and belong in our classrooms. 3. It improves classroom management, which in turn increases time for learning. 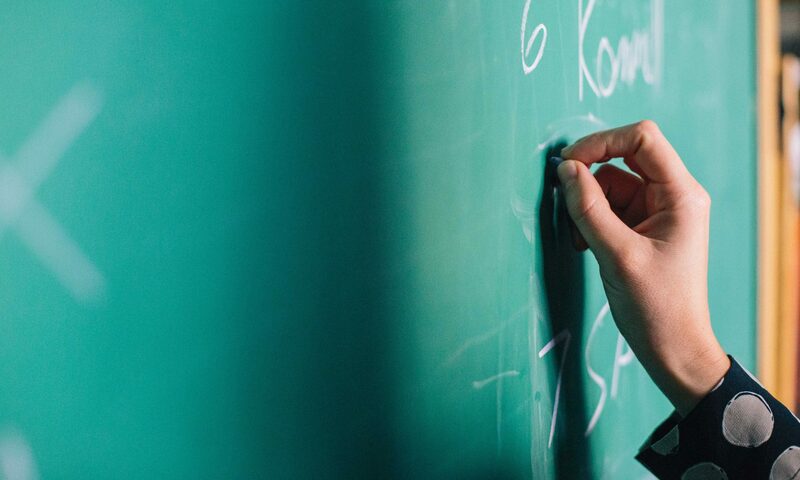 Edutopia recently shared an article based on 700 teacher responses on “5 Principles of Outstanding Classroom Management.” Guess what was on that list of top 5? Yep, building relationships. And when those relationships are secure, when they know they are seen and heard and belong, they are more willing to trust us as we guide them toward their learning. 4. It improves our modeling efforts. If we want our students to see themselves as readers, as writers, and mathematicians, as scientists, we need to model what exactly that looks like. As Lucy Calkins writes in her 10 Essentials of Reading Instruction, “Learners need teachers who demonstrate what it means to live richly literate lives, wearing a love of reading on their sleeves. Teachers need professional development and a culture of collaborative practice to develop their abilities to teach.” Such modeling is only successful if students have a desire to exemplify what we demonstrate, and that only comes through strong relationships. 5. It creates an atmosphere of greater authenticity. Especially for our students who struggle against “the game of school,” changing the rules by focusing on people first is powerful. Our students start to learn to trust that they can truly show up for the learning each day, because they will be seen and valued. What are reasons you have found to justify the time required for prioritizing relationships? The topic of discussion was on boundaries. My professor explained that if we’re clear and firm on our boundaries, students will recognize the limits and stay safely inside; conversely, if students sense a weak spot in the “fence” they will all come along to test it out. Seemed reasonable. I jotted a line in my notebook, adding it to my list of teacher preparation tips, and went on my merry way. What it did not prepare me for was the magnitude of said “testing,” not with my students, and most certainly not with my three year-old son. Take this morning for instance. He declared he didn’t want banana bread. His sister then asked for some banana bread. He then insisted that not only did he want banana bread, but made it clear that the world would end if he did not have banana bread. Knowing his track record for eating only two bites, I told him that if I gave him some, he would have. to. eat. it. That he would get nothing else until he did so. He agreed. And like a rookie, I fell for it. I gave him banana bread. Of which he took two bites. And then asked for something else. Here was my chance to hold firm on my boundaries, and boy, did he test them. He seemed to possess a finely tuned sense that my boundaries — and my sanity — were hanging on by the slimmest of threads. And the whole herd was rather methodically working away at that vulnerable place. 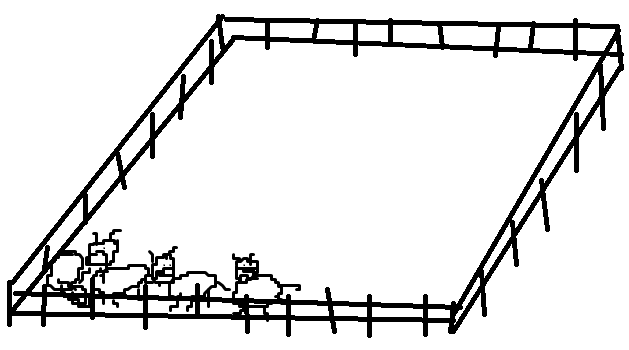 See, boundaries aren’t just about keeping the “herd” from wreaking havoc in every which direction. They are about compassion for ourselves and for those around us. We are compassionate enough to ourselves to hold true to our values (ie, food waste and follow-through in the above story). 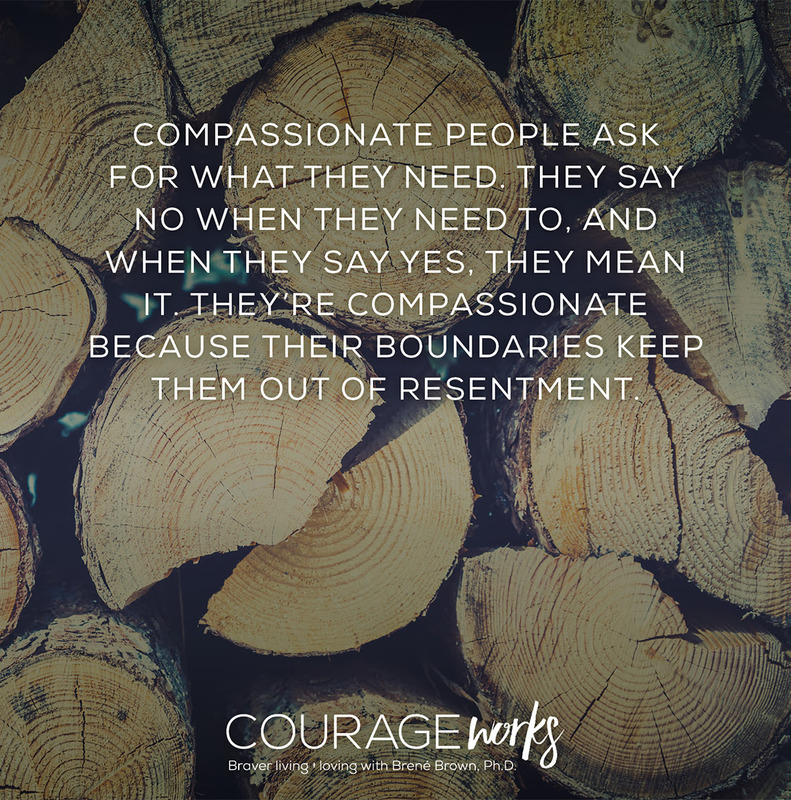 And we are compassionate enough to others to be clear, direct, and kind so that we don’t end up harboring unseen resentment (ie, lingering frustration with my son and myself had I caved). And so I held on. I worked to focus on those boundaries and my values I was working to preserve and instill, rather than the frustration that threatened to devolve the whole thing into a shouting match. Fortunately, this particular story has a happy ending. We left the banana bread for a couple hours and when we came back, he was perfectly happy to eat it before getting a new snack. Which just goes to show what a break can do for a battle of wills — and preservation of our boundaries and our sanity.